Left to right: Angela Rola, Roger Buckley, Norman Ikari, Lawson Inada, Fe Delos-Santos, Kyoko Ikari commemorate Japanese American Internment with poetry, jazz and camaraderie in the Jorgensen Gallery. Roger N. Buckley is Professor of History and the Founding Director of the Asian American Studies Institute at the University of Connecticut. The recipient of several distinguished research rewards, his numerous books and journals articles have been published in the United States, the United Kingdom, India, the Netherlands, Jamaica and Puerto Rico. Dr. Hanson is the Director of the India Studies Program, and she teaches courses on South Asia. She has received two Fulbright awards to India. Her current research focuses on the political economy of the Internet in India and more generally on the impact of new information and communication technologies on world politics. The 4-H Education Center at Auerfarm is a private, non-profit education center located on historic 120-acres that provides valuable hands-on and Farm to School experiences to more than 14,000 children throughout the year. Seasonal programs are offered to school classes, community groups, and the public in the Center’s animal barn, gardens, farmland and orchards. Visit www.auerfarm.org for more information. Jack Koichi Hasegawa supervised two units within the Bureau of Curriculum and Instruction at the State Department of Education until his retirement. He served as Chief of the Bureau of Educational Equity and member of the Sheff Office. He was also a member of the NCATE Board of Examiners and coordinator of Teacher Preparation Program Approval for Connecticut. William A. Howe, Ed. D., is the education consultant for multicultural education, gender equity and civil rights at the Connecticut State Department of Education. 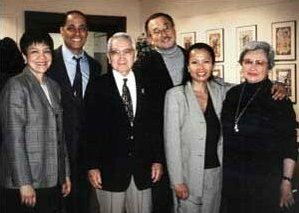 Dr. Howe founded the New England Conference on Multicultural Education (NECME), and served as Past-President of the National Association for Multicultural Education (NAME), based in Washington, D.C. He is on the boards of several organizations including the Asian Pacific American Coalition of CT (APAC). Cathy Schlund-Vials received her Ph.D. in English at the University of Massachusetts, Amherst, where she was honored with a campus-wide distinguished teaching award. Her research and teaching specialties include Asian American literature, Asian American studies, genocidal narratives, immigrant literary production, memory studies, 20th-century multiethnic modern and contemporary literature, and Asian American cultural production. She is the foremost Asian American scholar of Cambodian American genocidal remembrance in film, literature, and hip hop.